Several years ago, OneFoot set out to hike the 100-Mile Wilderness. That attempt came to an abrupt halt when an injury took him off the trail. 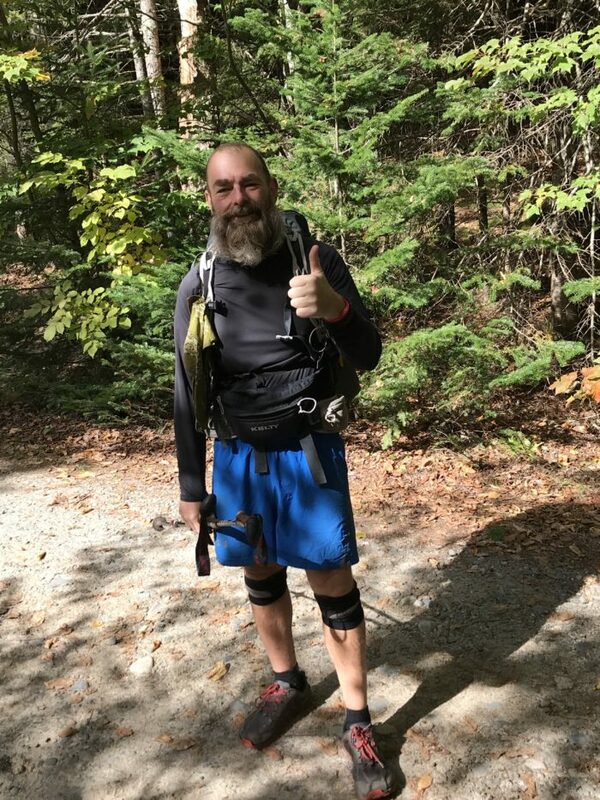 We learned that his pain was caused by iliotibial band syndrome (IT band) and that, my friends, is when OneFoot learned the importance of stretching. He made some changes to his physical routine by incorporating exercises learned in physical therapy. He was able to resume his running, strength training, and backpacking. 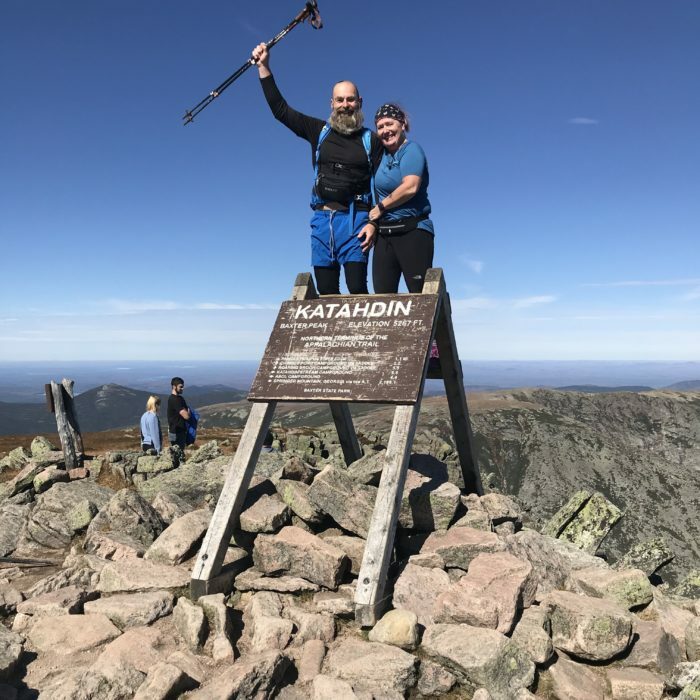 His intended plan for that trip many years ago was to summit Katahdin. After having to cut that trip short he decided to save Katahdin for the day he finished his long dreamed of Appalachian Trail thru-hike. 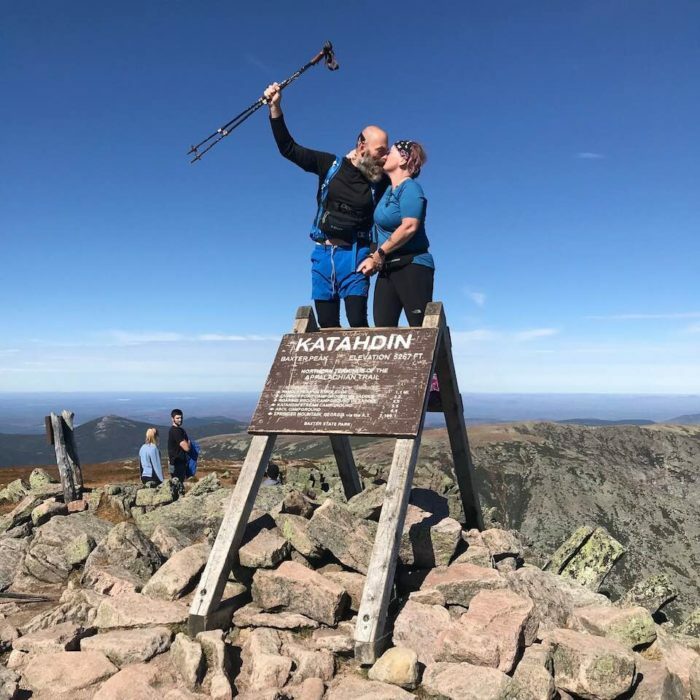 Since then he’s been to Baxter but never summited Katahdin. Until now. 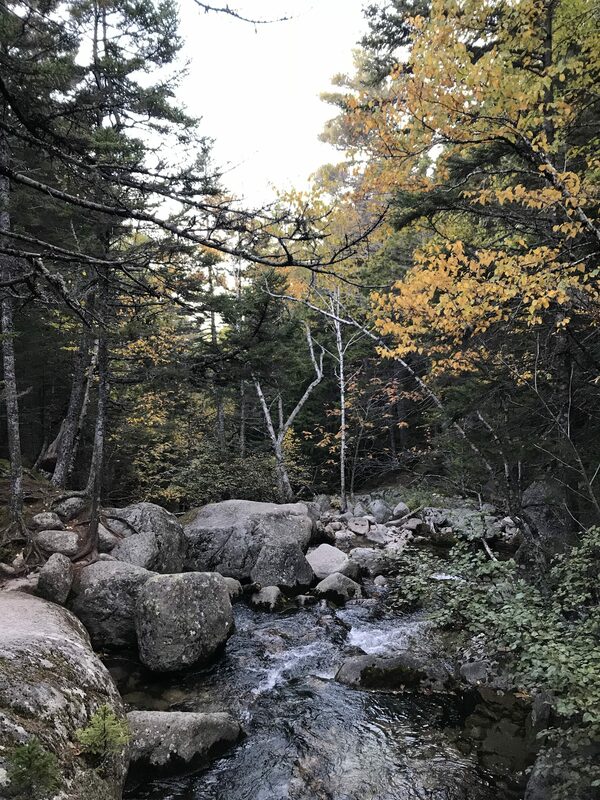 As anticipated, the 100-Mile Wilderness offered some of the best scenery and most peaceful surroundings on the trail. 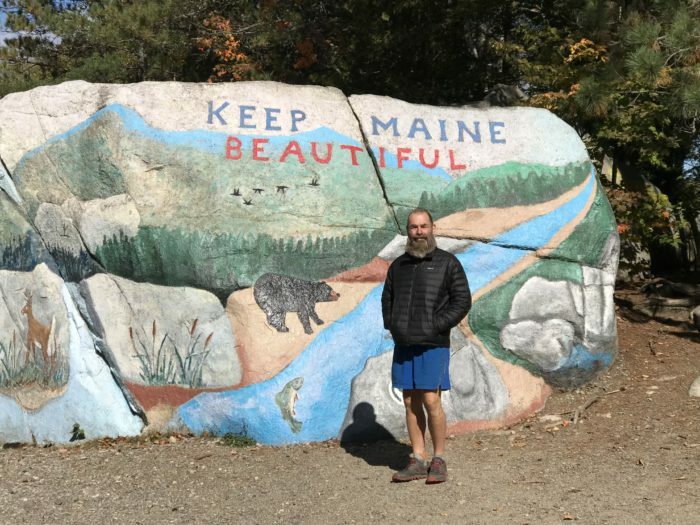 Even so, OneFoot did some of his biggest mileage days of the whole trip through the area and finished this section in about four-and-a-half days. He was feeling good and strong and ready to bring the trip to a close. This is an emotional section for many northbound thru-hikers and OneFoot was no exception. The realization of the enormity of what he was about to accomplish set in. He was also missing home and knew he’d soon be reunited with his family. It was in the last days of this section, as he entered Baxter State Park, that he let his emotions run wild. He was going to be a thru-hiker. This was really going to happen. 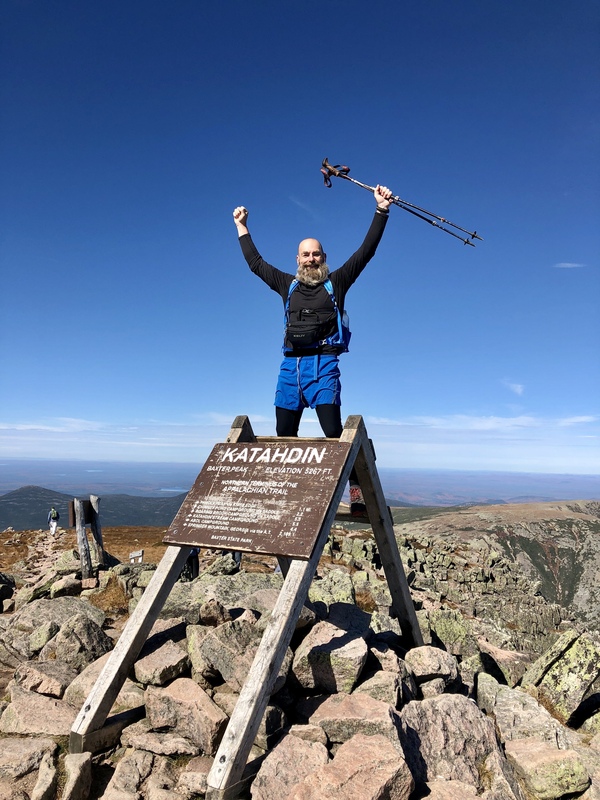 He reached Millinocket days before our anticipated summit. With some last-minute schedule finagling and a most gracious and supportive boss, I was able to alter my schedule for the week and scoot on up to Maine earlier than planned. OneFoot and I shared some good days together in advance of summit day. We talked about the hike, reflected on where we’ve been in this life, and where we want to go. At times, we just sat in quiet amazement. We arrived at Togue Pond Gate at 5:50 a.m., just ahead of the scheduled 6 opening. 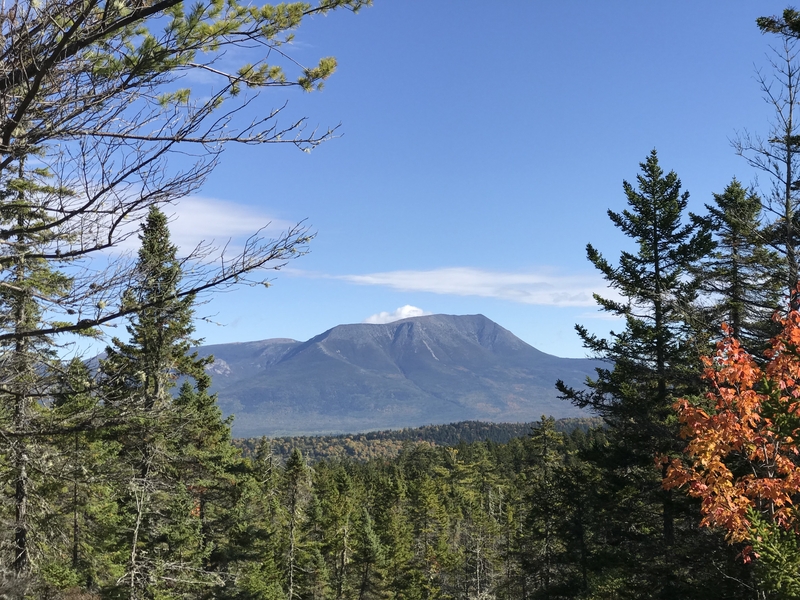 It’s a bit of a drive from the gate to Katahdin Stream Campground but we were on trail by 6:45. We shared some good conversation for the early part of the walk. 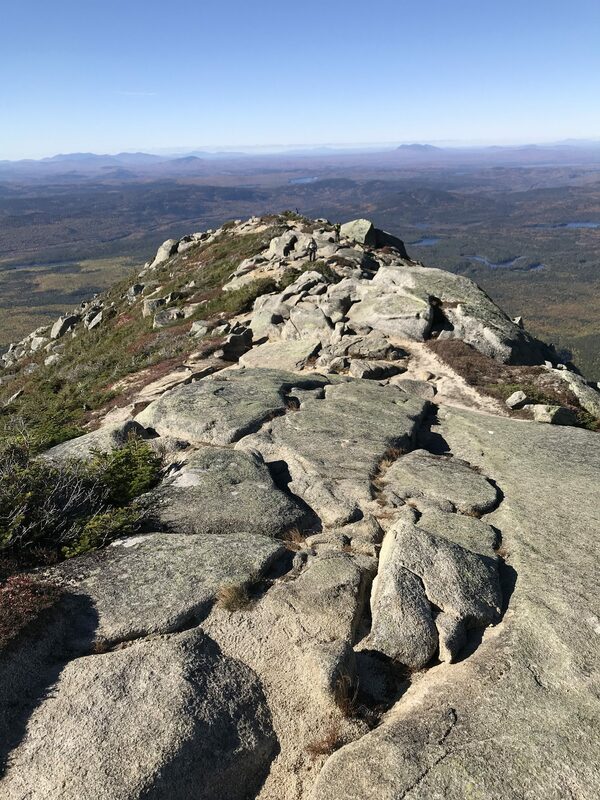 It was a bit surreal to be on the trail heading to Baxter Peak on Katahdin. All the years of planning and dreaming came down to these five miles. For OneFoot, the trail was quite reasonable. 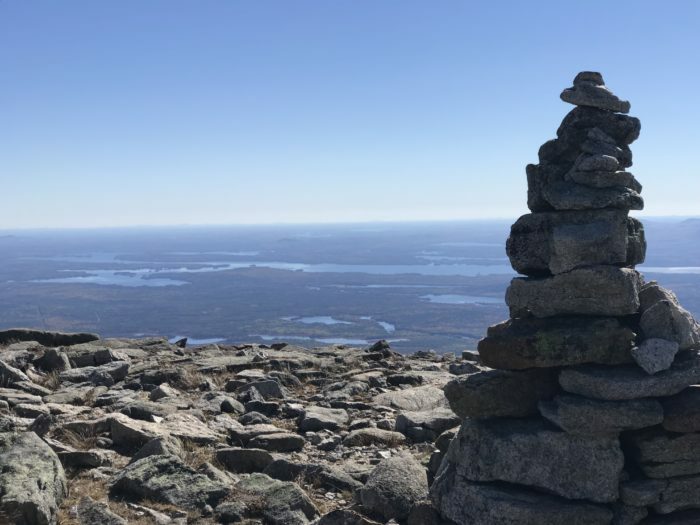 We heard many say that the Hunt Trail (AT) to the summit was very difficult. OneFoot thought the trail’s reputation was a bit exaggerated. With 2,185 miles done within the previous six months, I’d say he was in pretty good shape and well prepared for these final miles. For me? It was a challenge for sure and totally lived up to the reviews, in my opinion. There were times that I wondered if we’d done the right thing, having me along for these miles. As I watched other thru-hikers pass us on their way to the summit, I wondered (sometimes aloud) if OneFoot was missing out by keeping to my pace. He assured me he was right where he wanted to be and we both had worked hard for this dream. Eventually, I stopped asking him and just started to enjoy the walk and the magnificent views. I was right where I wanted to be, as well. The trail gods were shining on us when we reached the summit. It was a perfect New England fall day with bright sunshine and cool temps. I went ahead of OneFoot so that I could record the moment he lived the dream. I touched the sign and whispered a thank you to the trail. We waited a bit for the line of hikers to clear the sign and then it was OneFoot’s turn. Although I had imagined what the moment would be like, the reality was so much more. In that moment we both held the dream that we had wanted for so long. Words escaped me and the tears flowed. Love. Pride. Accomplishment. Amazement. It was overwhelming. So many emotions were waiting at the summit. 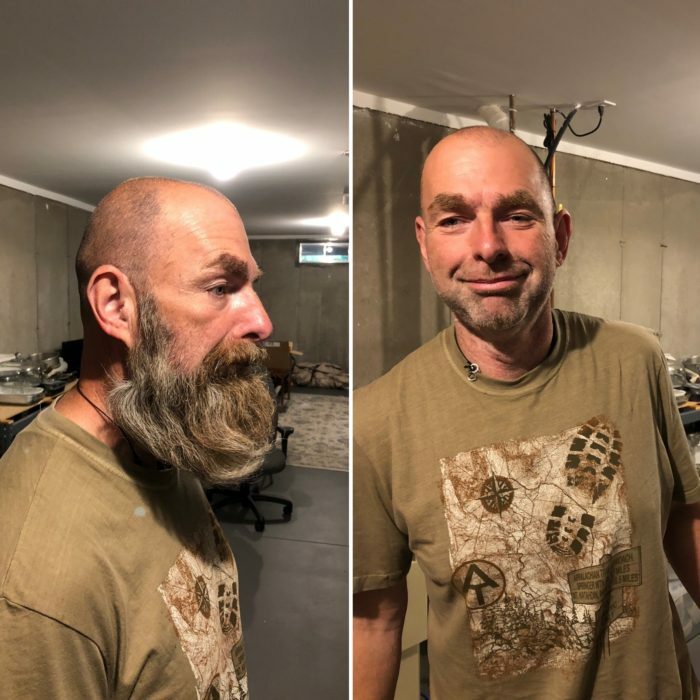 Ray “OneFoot” Galli was an Appalachian Trail thru-hiker. Truly, OneFoot hasn’t struggled with the move away from trail life. He is happy to be home and very grateful for his time and lessons on the trail. He always said he wasn’t running away from anything when he set out on the trail. It was the experience and challenge he was after. I think his age and place in life have helped with the ease of returning to “cotton life,” as they call it on the trail. We returned home on Saturday. Sunday was football and family dinner. Pasta, of course. On Monday I returned to work while he unpacked and reorganized his outdoor gear. Tuesday? Well, on Tuesday he went out and got a part-time landscaping job. He’s not one to sit around even after completing a 2,190.90-mile walk. I’ve definitely noticed differences in his personality and demeanor. He learned a lot about himself out there and about the person he wants to be. I’m watching and listening and trying to learn from him. I am also realizing how disconnected he was from the goings on in the world. How wonderful it must have been to be removed from all the negativity in politics and society. He is totally out of touch with such stuff and I wish he could stay like that. I seem to be having a greater adjustment curve. I still find myself taking my phone with me everywhere, just in case he calls. I was driving home from work on Tuesday feeling a little down. I was used to going home to an empty house. Then I remembered he would be home and we would soon enjoy our new routine of cocktail hour followed by dinner. The independence and self-reliance I discovered while he was away isn’t going anywhere. We are finding ways to incorporate our new roles and patterns with those we’ve established over the last 30 years. 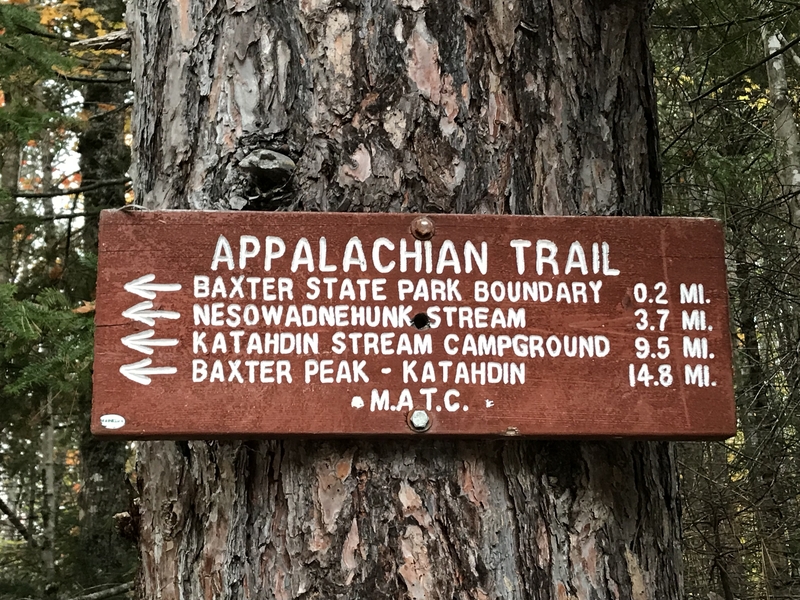 The PCT? The CDT? We were blessed with a big following of family and friends on this AT adventure and folks want to know what is next. 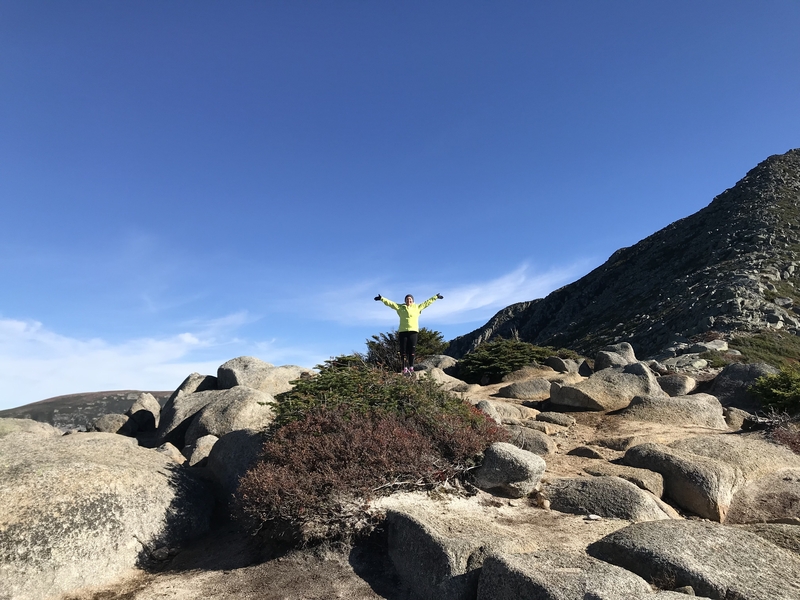 Although OneFoot has no immediate plans for another thru-hike, he is considering some time on the Pacific Crest Trail. Or the Long Trail. A month or so sounds like a reasonable goal for the next adventure. Neither of us is interested in another long-term separation. As mentioned before, we do plan to take Molly the Roadtrek out for an extended road trip next summer. That itinerary remains a mystery at this point. There’s so much we want to see. One of the greatest blessings of this journey has been the people. We have said this many times but it bears repeating. OneFoot shared the trail with so many awesome and amazing people. Together they shared goals, dreams, laughs, fears, frustration, and sometimes tears. Only those who walked the walk truly know what it took to get to any given point on the trail. As Nimblewill Nomad has said, the trail is a great leveler of humanity. It’s a pretty incredible idea that you can throw some strangers together from all different backgrounds, give them a common goal to aspire to, and then watch as they work together and support each other to reach that end. Hey, isn’t that how the world is supposed to work? Perhaps the trail makes it look easier because the goal is so clear. Much like family, these hikers had their ups and downs, highs and lows, differences and squabbles. And much like family, they will forever share a bond that runs deep and true. Just as important to this experience were the people off the trail. Team OneFoot provided above and beyond moral support and trail magic. Our faithful family and friends offered love and encouragement before, during, and now after the trail. What we find just as amazing is that this journey offered so many opportunities to renew relationships. College friends, former neighbors, childhood friends, and relatives (we’ve reconnected with so many cousins on both sides of our families). The blessings of the trail will live on through those reestablished relationships. Thru-hikers sign the ceiling tiles at the AT Cafe. There Is no Let. There Is Love. Before OneFoot left for the trail I gave him a compass pendant to wear on this journey. I told him I wanted to be sure he could find his way home. That compass has traveled with OneFoot from Georgia to Maine, all 2,190.90 miles. On Sunday, he endearingly returned it to me and it will now and forever share space on my cairn necklace. This journey was never about “letting” him go away for six months. This journey was about loving him and loving us enough to support and encourage this dream. It was about growth, renewal, and appreciating that life is a verb. 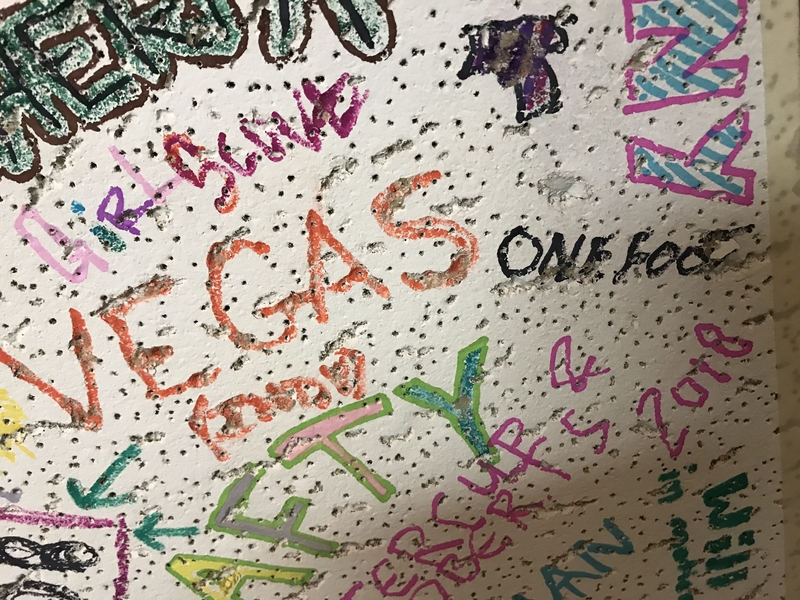 And so, our dear friends and followers, we’ve now come to the end of OneFoot’s AT adventure. He has done what he set out to do. Thank you, sincerely, for following along. If you take away anything from these last months, let it be that your dream is yours to capture and always choose kindness. It’s a special world out there on the trail. Who says that feeling ever has to end? Congrats to you both! I have thoroughly enjoyed your blog, anticipating each entry. Thanks for sharing. I’ve spoken with you both about this shared journey but, Cheryl, this is your best blog yet. It was “on steroids. Congratulations on finishing your AT hike. Enjoyed your excellent journal from both of you. I have thoroughly enjoyed following y’alls journey & it was inspirational on so many levels: my 24 year old daughter just completed the trail 9/16 & the perspective of OneFoot fulfilling his dream after a lifetime career, ShouldBeGood staying to maintain the home fires after over 30 years together, & right down to both your trail names helped me understand & truly FEEL all the sacrifice & joy the AT brings! Thank you both & know many more happy trails are ahead for us all!! I hate to see if come to an end but (for now) I’m sure you’re glad to get back to the cotton world. Don’t think I knew that term before but fitting. I hope you don’t become a stranger here. Post your summer RV travels, your section hikes, etc. Not sure about that landscaper job especially considering your location. There’s not a lot of grass cutting going on. Pretty soon it’ll switch to 100% snow removal. Question on that tho, are you looking for a new 9-5 career? Or are you set in your retirement such that you only need to work if/when you want? I’m hoping the latter. If you’re able to retire full time, go get some hobbies. Wood working requires huge amounts of patience; one of the new traits you learned on the trail I’m sure. And it’ll keep you connected to nature. More than posts about all the above, I want to see a post in 3 to 6 months. Now you’re glad to be home. Good time for it with the upcoming holidays and all that. In 3 months, the holidays will be gone, winter will have set in, etc. What happens when you get home sick for the trail? How do you deal with people en masse doing what people en masse do (bicker over nothing, the FB crowd fighting over politic, etc.)? Maybe consider writing a piece now even just in your journal. Then take it out again in 6 months, a year, 3yrs and see where you are compared to where you thought you’d be. Might keep you focused and redirect you when post trail you tries to make a comeback. Excellent post! What an adventure! I am so glad to have been able to follow your journey…both of your journeys. Loved every blog and post. Congratulations to you both! From the very beginning when I first met the two of you through your blog, I knew you’d both be successful in this huge adventure. Job well done! Update in the new year, please! I’ll miss you.